With five kids, I've made a lot of birthday cupcakes for them to share with their classes over the years. I keep hearing of schools that don't allow homemade food or others that are starting to outlaw treats altogether. 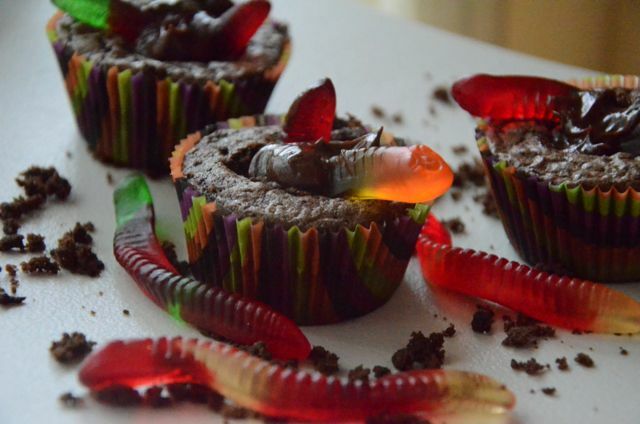 I, for one, love making fun and creative treats for my kids and would be a very sad mom indeed if they ever outlawed them at our school. I love doing it so much that I bend over backwards to accommodate their classmates' variety of food allergies, so that everyone possible can enjoy them. I pretty much never bring nuts into the school, since there always seems to be someone in all their classes that's allergic. 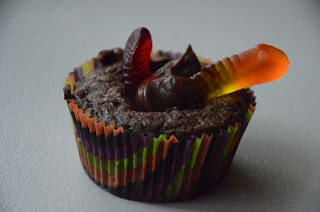 And depending on the other allergies, I can use my milk and egg free cupcake recipe for those with dairy allergies. I make my very yummy gluten free recipe for those with celiac. And for the one year that one of my kids was in a classroom with kids with nut, dairy, and gluten allergies all in the same classroom, I made fun rice krispie treats with butter substitute and gluten free rice krispies from the health food store. I love seeing how excited the kids with the allergies get when I tell them that they can actually eat the birthday treat I've brought! For my son's birthday this year, he wanted something fun and Halloweeny! 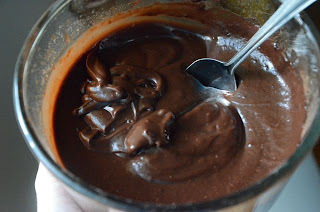 I was pleased to discover that the only allergy to accommodate in his class this year was nuts...so I broke out a brownie mix to make it easy! 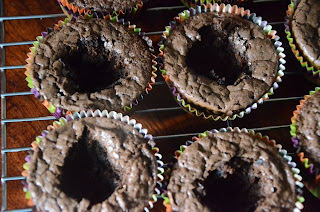 I made the brownies as directed on the package and poured the batter into a lined cupcake pan, baked them for 18-20 minutes, let them cool, and scooped out the centers. 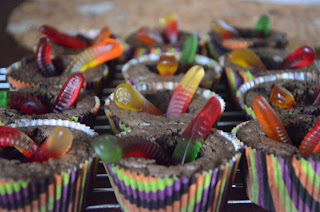 ...it's a super easy, super fun birthday/Halloween treat, which his classmates absolutely loved! 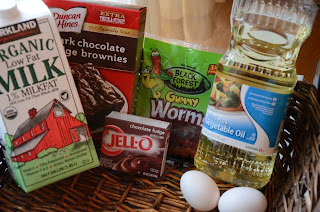 Make the brownie mix as directed on the box (I used the directions for "cake-like" brownies). 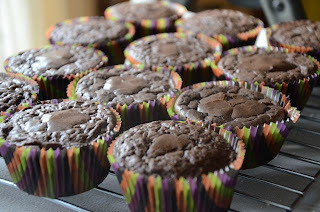 Add paper cupcake liners to a regular sized muffin pan and fill each about half-filled with brownie batter. Bake at 350 degrees for 18-20 minutes or until brownie cupcakes test done. Remove from pan and allow to cool completely. With the edge of a spoon, scoop out a small circle in the center of each cupcake. With the back of the spoon, press gently around the edges of the hole to smooth out a bit. Add a teaspoon or two of pudding (how much you add will depend on how big your holes are) to each hole. 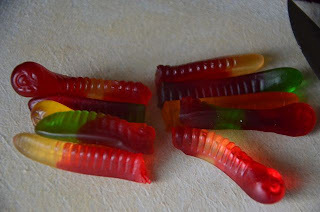 Place two gummy worm halves poking out of each pudding filled hole. Store in refrigerator until ready to serve. Makes 18 cupcakes. Use scooped out centers to sprinkle over the serving tray to look like dirt. They're also great stirred into a batch of chocolate chip cookie dough!